Self-esteem and internal locus of control have been shown to be dynamic. A teacher may establish and manage the classroom climate required for such enhancement. Adolescent brain development can be managed to modulate stress response, learning and memory functions and hence, academic performance. Here it is reported that three separate cohorts of 90 students were found to experience transitions from low to high self-esteem at different times of a study year, perhaps due to differences in school climates. Whereas transitions occurred early in the year for one cohort, others happened several months later. For one cohort, 38 percent of students did not appear to complete their transition within an eight month study period. The causative factors were possibly inherent in the methods of individual teachers. It is important to identify and manage the factors responsible, otherwise students may not experience enhancement in time to pass examinations. Adolescence is a critical time in the human life cycle. Characteristic behaviours of adolescents have been explained as the result of a shift from the impulsive, fear- and emotion-centred responses of the hypothalamus-amygdala, to reasoned, discerning and abstract thinking, possible through the prefrontal cortex. The stress response of adolescence changes upon entering adulthood. Initially, stress response is epigenetically modulated in the postnatal period, through maternal care that causes changes in stress behaviours. The characteristic stress response in adolescents involves acute increases in concentrations of cortisol, over periods of longer duration than adults. Stress response is then further modulated in adolescence, through an unidentified mechanism, which in adulthood results in higher concentrations of cortisol with shorter duration, presenting less risk of impairment to the hippocampus. This period of developmental change has also been noted as a possible time for introducing interventions, to mitigate negative consequences of earlier developmental insults. It is necessary that these changes occur, otherwise an individual in adult life will be at risk of diseases of developmental origin, particularly obesity, diabetes type 2, hypertension, cardiovascular diseases, autoimmune dysfunction, impairment of neurodevelopment and certain cancers. Modulation of the stress response in adolescence also has serious implications for learning and memory functions of the hippocampus. Imaging has proven to be a convenient way of documenting impairment and atrophy of the hippocampus. Maturation for example, has been shown through imaging to result in significant volume expansion. Adolescents need hippocampal functions in good working order if they are to obtain an education and have a career. Reduction of the hippocampal component of the stress response has been further shown to be associated with enhancement of self-esteem and internal locus of control. These two characteristics, although regarded for decades as static, have both been positively correlated with academic performance. A study undertaken in China in 2007, with 90 adolescent students, has shown self-esteem and internal locus of control to be dynamic. Behavioural science theory suggests that these characteristics may be fostered in students through the application of social and experiential factors. This was tested with meticulous recording of changes of these characteristics in students, whose exposure to the factors was maintained over an eight month period. Ninety percent of the students were found to have experienced a positive transition in both self-esteem and internal locus of control. Some experienced the transition over a period of less than one month, while for others it occurred over several months. A small number did not appear to complete their transition within the eight month period of study. About 10 percent did not appear to experience it at all. Establishing cause in the education process is confounded by the existence of many independent variables, such as population differences among students, effects of different teachers, different education curricula and various learning and teaching strategies. Causality can as a result only be established if unambiguous criteria can be identified, which positively confirm that the changes in self-esteem and internal locus of control result from the actions of a teacher. The causes of differences in academic performances between schools are widely recognised as difficult to establish. Figure 1 illustrates the differences in academic performances among 595 schools in New South Wales, Australia, seen as the percentages of high achievers presented at a state-wide university-entrance examination. A small number of schools were able to present from 10 to 70 percent of their students as high achievers. The vast majority presented from zero to 2.5 percent. This wide disparity among schools illustrates the effects of multiple independent variables. As a result, introducing experimental controls to establish causality, when investigating the academic performances of students, has difficulties. It would be both unacceptable and impracticable for example, for a teacher to exclude some students from the education process for eight months, then to test their self-esteem and locus of control. If these students were taught by different teachers, then they could not be compared, nor may their performances in different subjects, particularly if taught under different curricula. Such measurements may be sufficient to confirm the hypothesis that self-esteem and internal locus of control and hence, modulation of the hippocampal stress response, can be achieved through exposure to social and experiential environmental factors. Until such confirmation occurs, social and experiential factors in particular need to be investigated, to determine their effectiveness in assisting students to achieve enhanced academic performance. It was shown for three cohorts of students in 2007, 2008 and 2009, that the transition was able to occur regardless of whether they initially possessed greater or lesser academic ability. After the transition they were indistinguishable from one another as high achievers. This has given support to the hypothesis that developmental genes needed in adult life may be switched on through epigenetic intervention. There were however differences in the timing of the transition experienced by students of initially different ability. The causes were unclear. However, if in a particular year there occurred a delay in onset and completion of the transition, then some students may not have reached their optimum by the time they were to sit for final examinations. The aim of this study was to examine the timing and duration of the transitions for the three cohorts of 90 students. Ninety 18-year old students enrolled to study university-entrance subjects were selected for the eight-month trial in each of 2007, 2008 and 2009. Enhancement of self-esteem and internal locus of control was undertaken according to Shindler’s behavioural science approach, simultaneously with traditional learning and teaching techniques for the study of physics. 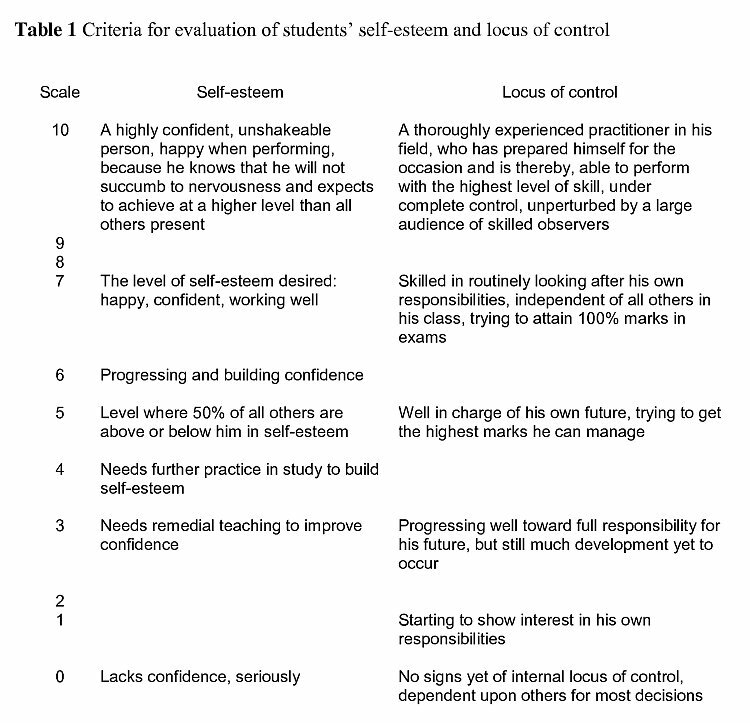 Monitoring of self-esteem and locus of control was based upon estimations by a teacher, using behavioural criteria as shown in Table 1. Students’ study notebooks and formal testing provided the basis for estimating developmental changes for each characteristic in every student. 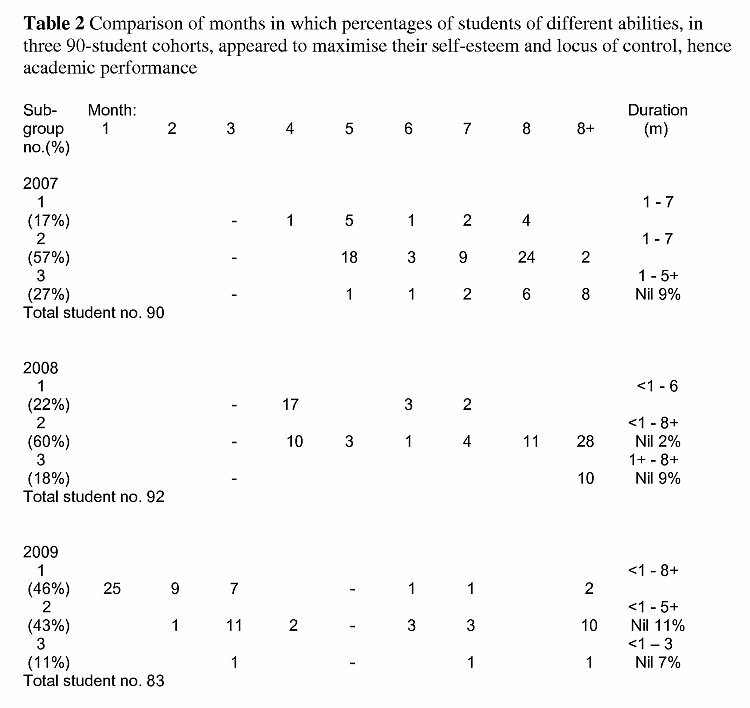 Table 2 contains a comparison of the months in which percentages of students of different abilities, for the three 90-student cohorts, appeared to maximise their self-esteem and locus of control. The developmental plateau obtained was associated with criteria for self-esteem and internal locus of control (Table 1), test marks of 90 percent or more, together with meticulous recording of private study notes and conscientious practising of study problems. However, a minority of students appeared each year to have experienced the transition without reaching the plateau within the eight month study period. In a particular year (2008), students who experienced incomplete achievement of the plateau represented a total 38 percent of all students. None of these were from students with initially greater ability, but 28 percent were from those in the middle level. Ten percent were from those in the lower level of ability. Non-completion of the transition on such a scale appeared to have been specific to that particular year. There were also some students in the middle and lower ability sub-groups, up to 11 percent, who appeared to not experience the transition at all. The finding in 2008 that 38 percent of students did not appear to complete their transitions in the eight-month study period, gave rise to much concern because of the effect this might have upon final examination results. While testing for the last 25 percent of work for the year (on nuclear physics) showed 37 percent of students were marked >90 percent, this was significantly less than the 52 percent of high achievers in the previous year. The extensive course in nuclear physics with an examination conducted in the last month of the study year, was otherwise a good barometer for what might be achieved in the final examination. The inability of a significant percentage of students, to complete their transitions within the study year, appeared therefore to be a diagnostic indicator of a negative influence on some students’ ability to study successfully. It had been recognised from the outset that there were independent variables working against efforts to assist students to study successfully. Hence, a list was made of possible independent variables (Table 3) which could have contributed to the over-run in 2008. An observation made in 2009 by a student from the 2008 year suggested that social relationships within classes played a significant role. The observer was able to confirm by direct comparison of student behaviours in 2008 and 2009, that in 2008 an infectious social attitude led many to waste the first two to three months. This was a delay in committing to study conscientiously despite the obvious difficulties of doing this in English, their second language. Although students of higher ability immediately responded to the need to study, those with less initial self-esteem procrastinated. Whereas in 2009, students were at the commencement of the year, keen to join in the publicly known record of success at the school. It was apparent from this illustration that many social situations may occur in a school, which need to be monitored and managed with care. From the list of student-centred variables shown in Table 3, there appears to be a need to document the impact that each may have, so that the effects may be recognised and countered as they occur. Communicating such findings may enable a body of management experience to be assembled for use in schools. A further variable was identified in 2009, the result of better understanding of the program by assistant teachers, who became more effective in facilitating the building of self-esteem and internal locus of control. A most significant variable was a teacher’s ability to become accepted as a role model, gaining trust and becoming better able to implement acceptance-belonging and building of self-efficacy. School climate has otherwise been well researched and described as the single most predictive factor in the capacity of a school to promote student achievement. Initiating and managing an effective school climate has for many schools taken second place to the priority given to means of enhancing student achievement. Shindler et al have, through studies of 21 urban public schools in California conducted by the Alliance for the Study of School Climate, shown a strong relationship between the quality of school climate and academic achievement levels. Contrary to the opinions of many teachers, better climates were found to lead to achievement and were not simply a byproduct. From this finding that many students may not completely experience enhancement of their self-esteem and internal locus of control, it became clear that future research should focus upon the identification of numerous independent variables. The preliminary list shown in Table 3 is speculative. It needs to be confirmed by documentation of the effects these and other variables may have upon the futures of students. An optimum set of school-wide climate management initiatives may in this way become available for the teaching profession. A most important area of research suggested from this study of students, who were unable to complete their transitions, is the feasibility of applying this program to younger students. It may transpire that a single year at the age of 18 years is an inappropriate duration and time for a developmental intervention. It also needs to be established how far the transition experienced in one subject can benefit a student in other subjects. In many schools there are teachers who refuse to teach students how to study or to institute management initiatives to ensure that student private study is effective. Those teachers consider that student study is entirely the responsibility of the student. If the student is unwilling to make the effort, then he is considered to be inappropriate material for university study and a professional career. There are numerous categories of students who stand out in classes because of a range of apparent learning handicaps. These also should be the subject of documentation, with specialist assistance to advise on remedies for their difficulties. In classes at Qianhuang in 2009 there appeared to exist an unfortunate group of boys who sought security in the company of each other. None appeared to experience the developmental transition, nor did any acquire sufficient study skills to become capable of undertaking study for a university degree. They flagrantly plagiarised work of others and rejected the widely accepted study discipline. Their thinking was ego-centric as in younger children. They appeared to have no interest in accepting the teacher as a role model, as did the majority of their classmates. It is suggested that groups such as this should be documented with the assistance of a social psychologist, who may be able to remedy their counterproductive interdependence. A significant negative effect, upon the ability of students to achieve their transition in self-esteem and internal locus of control, can result from any one of numerous independent variables. In this study it is likely that the teacher was not sufficiently aware of socially infectious procrastination occurring among middle and less able students. There is a need to encourage many schools to systematically identify variables and communicate documented effects upon student development. In this way a body of student management experience can be built up and made available throughout the teaching profession. The research proposed should involve many other disciplines, including social psychology, developmental science, psychiatry and epigenetics. Blakemore, S.-J. and Choudhary, S. (2006). Development of the adolescent brain: implications for executive function and social cognition. J. Child Psychol. Psychiatry, 47 (3-4), 296-312. Blakemore, S.-J. (2008a). Development of the social brain during adolescence. Quart. J. Exp. Psychol., 61(1), 40-49. Johnson, M. H. (2008). Brain development in childhood: a literature review and synthesis for the Byron Review on the impact of new technologies on children, 14 January. McEwen, B. S. (2007). Physiology and neurobiology of stress and adaptation: central role of the brain. Physiol Rev87, 873-904. Shindler, J. V. (2009). Transformative classroom management: promoting a climate of community and responsibility. Chappaqua, NY: John Wiley and Sons. Ayling, G. M. (2011). Epigenetic activity in adolescents: a hypothesis – mediation of students’ hippocampal stress response by a teacher. Publ theforrestproject.org, 2011, Oct. F/0001. Ayling, G. M. (2011). Epigenetic activity in adolescents: teaching methodology to assist brain development and modulate the stress response. Publ theforrestproject.org, 2011, Nov. F/0002. Ayling, G. M. (2011). Epigenetic activity in adolescents: a working hypothesis for student development and enhanced academic performance. Publ theforrestproject.org, 2011, Nov. F/0004. Ayling, G. M. (2011). Epigenetic activity in adolescents: report of a transition in self-esteem and internal locus of control in which students of different abilities became high achievers. Publ theforrestproject.org, 2011, Nov. F/0005. Shindler, J. V., Jones, A., Taylor, C., and Cadenas, H. (2004). Does seeking to create a better classroom climate lead to student success and/or improved teaching? Examining the relationship between pedagogical choices and classroom climate in urban secondary schools. Paper presented at Conference of the American Educational Research Association, San Diego, April 12-16. Shindler, J. V., Jones, A., Williams, A. D., Taylor, C. and Cadenas, H. (2009). Exploring the school climate – student achievement connection: and making sense of why the first precedes the second. Paper published by the Alliance for the Study of School Climate, Charter College of Education, California State University at Los Angeles.